No Time Management Tuesday because we're just coming off a holiday weekend, during which I made two blog posts. I'm not obsessive, after all. Well, I am obsessive, but I try not to be obvious about it. 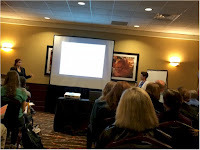 The big news in Connecticut this month is the B-Fest Teen Book Festival Barnes & Noble is running June 10 through 12. It's a nationwide event. 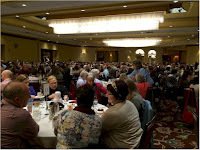 Here in Connecticut it involves lots of author appearances. Fri., June 10, Pegi Deitz Shea, Barnes & Noble, Manchester 7:00 to 9:00 PM Poetry slam with workshop for teens following. 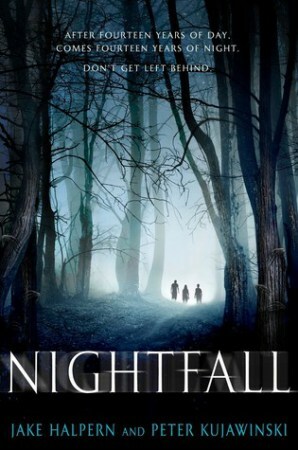 Wed., June 29, Nora Raleigh Baskin, Barnes & Noble, Westport 7:00 PM Discussion on writing with two adult writers. The UConn Libraries has announced the end of its partnership with the UConn Co-op Bookstore, a partnership that's largest project was the Connecticut Children's Book Fair. The announcement included the news that there will be no Book Fair this fall, though something may be planned for next spring. This action, UConn Libraries states "is due to the vote by the UConn Board of Trustees to partner with Barnes and Noble Education to run its bookstores for the future and that transition will begin after June 7th." However, we can't tell from this particular communication whether Barnes and Noble Education has no interest in working on the book fair or isn't coming on-board early enough in the year to get the fair up and running in its traditional November month. I have a family member who thinks that if you're going to make dramatic changes in an established character and her world, why not just give her a new name, too? To him, you're no longer working with the original material. I, on the other hand, enjoy it when someone messes with the known. The first Mission Impossible movie when Mr. Phelps ended up doing what he did? The rest of my family was distraught, but I loved it. 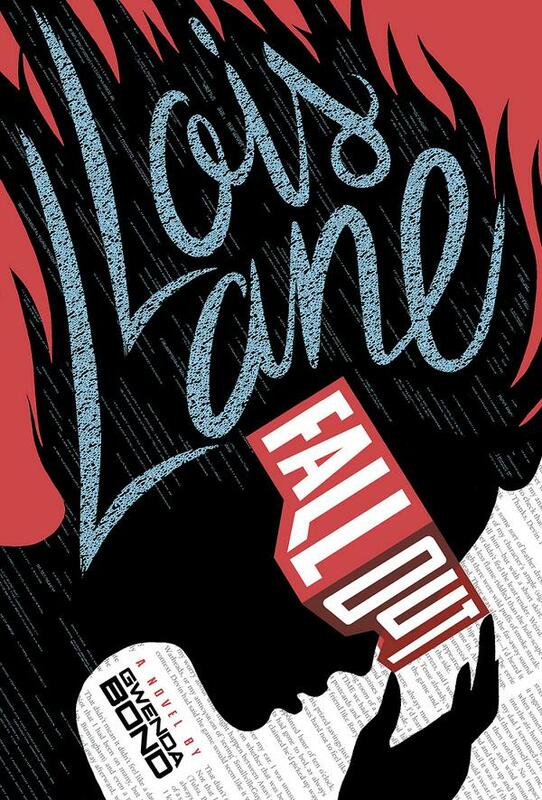 So, yes, I liked Lois Lane: Fallout by Gwenda Bond. Lois is a contemporary teen, not someone from the original comic book era or an adult. She's a bit of a troublemaker. Is it because she's had to change schools a lot because she's a military brat? Or is it because she has an uncontrollable need to help the downtrodden? She has a future as a crusading reporter, though she doesn't realize it at the beginning of the book. You know, "crusading reporter"--that's a phrase I don't hear much anymore. This teen Lois also knows teen Superman, but only on-line. And, of course, she doesn't know he's Superman or is going to become Superman. This Lois can almost do without him. She doesn't need no Superman, especially in the form of a teenage boy who will only interact with her over the Internet and won't even tell her his name. But, okay, okay. Lois Lane is from the Superman universe. I get it. He has to be there, whatever his age. One of the most interesting things about this book doesn't have anything to do with the Superman narrative. Fallout is about bullying. We're not talking an improving "Bullying is baaaaaad" story. 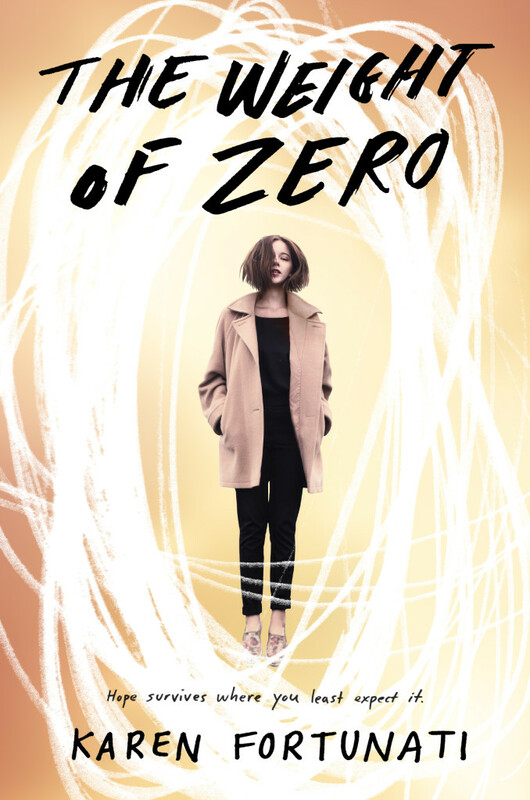 This is a thriller in which students are turned into bullies and then bully others into becoming bullies, too. It's all part of an evil plot, which I won't go into because that's a particularly good part of the book. But Why Don't Any Adults Notice? This is, I have to say, one of those books, like Evil Librarian, in which dire things are happening and no adult seems to notice. The bullies are all dressed in black and behaving in a disturbing manner and not a single teacher raises a red flag? I get why the principal and computer teacher didn't, but they weren't the only adults in the building. Teenagers with behavioral problems have done some horrific things in schools over the last decade or more. One kid like the bullies in this book might be able to stay under the radar, but, logically, that many would have had someone keeping an eye on them. (I sure hope so, anyway.) It's also unbelievable that not a single parent voiced concern over the dramatic change in their kid's behavior. Or raised questions about where their child was going in the afternoons. Lois, herself, is great. She has personal power and an edge. 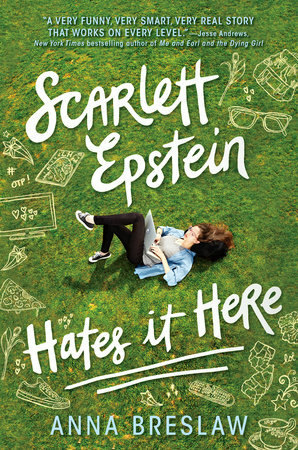 A second book came out this month, one that looks as if it will take Lois out of the high school. And there are a couple of free digital short stories, so you can be introduced to Lois and her world right away. Another Cooking Binge, Another Podcast: "The Memory Palace"
Last week I was just about ready to throw in the towel with podcasts. I'd been interested in listening to them while working in the kitchen as a way to take in work-related material while doing an unnecessary creative act. I did pick up some good information, particularly on content marketing, but I was trying and discarding a lot of podcasts. Things I liked the first time I listened to them got old fast when I tried them again. When pods involved more than one personality, the ratio of chitchat to important content was often pretty high. I guess you can tell you're an introvert when you can't even take listening to others having a good time. But I really like something going on sound-wise when I'm working in the house. Music is a definite option. Nonetheless, last weekend, I was embarking on a big cooking binge and thought I'd take another quick look on-line. Somehow, I stumbled upon The Memory Palace. The Memory Palace's creator, Nate DiMeo, describes his podcast as "a storytelling podcast and public radio segment about the past." He takes isolated historical events and creates a written narrative about them. If you go back to the early days of the podcast, the story is often just an account of something that happened. But eventually his pieces began to include something on the event's significance. For instance, in his story about nineteenth century singer Jenny Lind, he talks about a major difference between her time and ours. In her day, before sound could be recorded, before recording sound was even thought of, you could only hear music during a performance. In many cases, you would never have another opportunity to hear a singer. Did people even give that a thought? Or was it just a normal part of life? The significance part of these stories is important. History isn't just a list of facts. It means something. And in terms of The Memory Palace being a storytelling podcast, meaning is huge. Many times without including an understanding of a real event, all a storyteller/writer is doing is passing on a list of things that happened. What does it all mean, Mr. Natural? brings a piece of writing to another level. Another thing that's neat about these podcasts is they're short. So far, I don't think I've listened to one that's more than fifteen minutes. 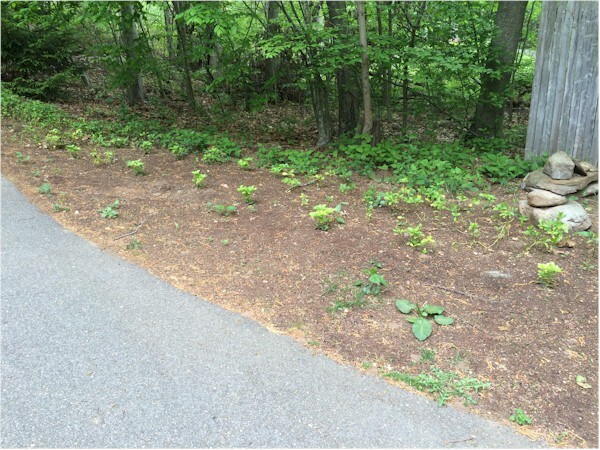 DiMeo is "interested in keeping things small because I was interested in the smallness of those things" (the historical "moments" he finds) "and the way they added up to a larger picture." These short podcasts are like flash nonfiction. They are intense and complete. They give listeners an opportunity to see how someone finds meaning in an event in a quick, concise way. They have the potential, I think, to become a painless model for looking for and finding stories. Hope I still like them in a few weeks. 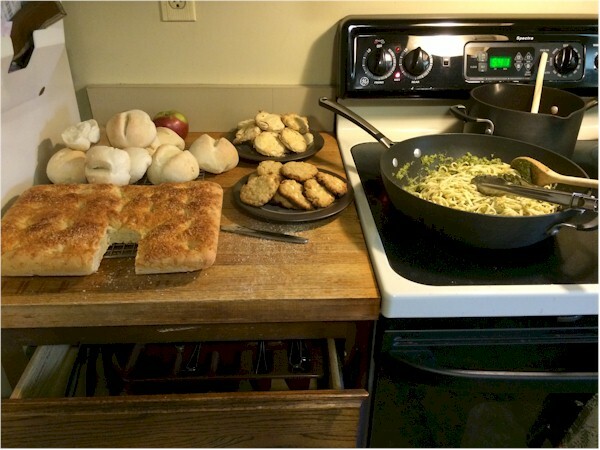 I heard about Weekend Cooking through blogging buddy Alex Waugh of The Children's War. 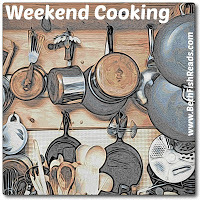 I most definitely cook on the weekend, and it is often somehow connected to writing or reading, as is most things in my life. So this weekend I am taking my first shot at joining the weekend cook/book people at Beth Fish Reads. 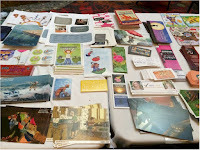 Authors and illustrators will have opportunities to sell their own stock of books, and to give a talk, a workshop/activity, or a reading of their book. Illustrators may sell their originals and/or prints. Please note: ACE is a relatively new organization, with a limited budget. 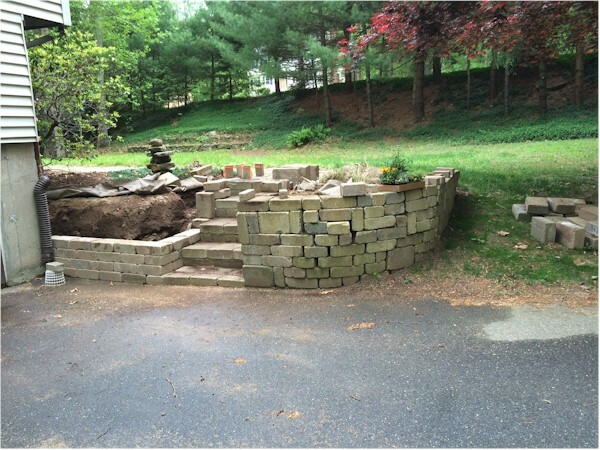 Participants are responsible for framing, matting, insuring and transporting their materials. 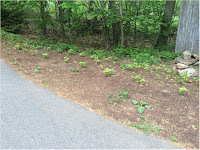 For more information, please contact: Joan Sonnanburg, Executive Director at joan@artscentereast.org / (860) 871-8222. Please indicate the type, size and number of your pieces when you respond. NOTE: This event is not limited to Connecticut authors. Just keep in mind that participants must cover their own insurance and shipping costs. Time Management Tuesday: The Longest Day Of The Week. Seriously. Anyone else notice Tuesdays seeming particularly long? Me neither. But it's supposed to be a thing. "...time can feel like it's passing more slowly on Tuesdays compared to other days of the week." There are a couple of theories as to why this happens. The one that I can just barely understand goes something like this: Weekends we don't do so much. We're not filing away a lot of events/tasks in our memories. Monday we're transitioning into the work week, still not doing as much as we will later in the week, still not filing away a lot of events/tasks in our memories. "On Tuesdays, we're in the thick of it. Hence, it's possible that our brains generate more discreet memories on Tuesdays, making Tuesdays seem as though they're longer than other days." A lot about time management involves psyching ourselves out. We work in 45-minute units with brief breaks so that when we start a new unit we think we're starting the day over with a fresh load of will power. It's also a "trick" that provides us with an external support for will power. We try to treat our time slip-ups with compassion so we don't succumb to the what-the-hell effect. Is there some way we can use the illusion that Tuesdays are longer to actually do more? My guess is no, since it sounds as if those who feel Tuesdays are longer days do so because of their memories of what they've already done and not because they perceive Tuesday as being long, and thus providing more opportunities to do things, while they are actually living through the day. The theory above lends support to my impression that Mondays are lousy transitional days, though. "On Mondays, we're just getting caught up." All day? Like many young people, I read Sherlock Holmes as a teenager. I struggled to learn the difference between inductive and deductive reasoning. (Yeah. I never worked that out.) I wanted to be Holmes. As an adult, though, I've wondered why I see so very many children's and YA books relating to Sherlock Holmes.The original Sherlock is not a fun guy. He's kind of stodgy. I can't recall any young people in the original stories. Thematically, the original stories are not about place in family or separating from family or finding a place in the world, which is what child and YA books traditionally are about. But I recently read two Sherlock-related stories, one after the other, that suggested something new to me. Sherlock Holmes was an early superhero. His superpower? His intelligence. In the YA Sherlock update A Study in Charlotte by Brittany Cavallaro Holmes, Watson, and Moriarty were all real people, not characters in books, and their descendants walk among us. (Hmm. That's sort of like The DaVinci Code.) The present Holmes and Watson representatives are teenagers Charlotte Holmes and Jamie Watson. Their families no longer have contact with one another, so what a coincidence that they should land at the same private boarding school in Connecticut. Jamie's kind of a regular guy. He is, after all, just the descendant of a writer. Charlotte, however, is something else. Holmeses have been Holmeses for generations. She is a chippy off the ol' Sherlock block, brilliant, intense, a bit haughty, and fond of drugs. She's been known to help out at Scotland Yard. So, of course when someone starts framing her and Watson for murder, she doesn't just sit back and let the local police take care of things. No one can handle the case as well as she can. Because, you know, she's got that super intelligence superhero thing going on. And now with Jaimie, she's got a sidekick, too. The members of the Holmes and Watson families are not a hundred percent terrific people. The members of the Moriarty family are not a hundred percent awful. Though Holmes and Watson are drawn to each other, I didn't read this as a romance. (Though I may be mistaken.) It's more like Holmes and Watson are more together than they are apart. I've read YA books that were essentially adult thrillers in which the main character had been replaced by a teenager, a teenager who was very adultish, we were all just saying s/he was YA. That could have easily happened here, since the source material is adult fiction. But it doesn't. Charlotte, for all her Holmes-behavior, is also very young. She actually gets along with her boarding school roommate. She may have actually wanted to go to that dance. She's a victim of...well, I won't give that away. Like Marvel superheroes, Charlotte suffers. A couple of YA thrillers I've read recently are very unrealistic in their portrayal of adults. In order for the YA characters to have control of the action, the authors don't deal with the fact that, realistically, some adults somewhere would have been wondering what was going on and trying to protect their kids. Here the adults are present and trying to do what they can for young Holmes and Watson. 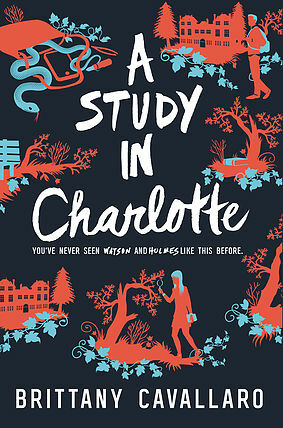 A Study in Charlotte trailer: Though this is twice as long as I thought book trailers are supposed to be, if you've read the book, it's like watching a mini-movie adaptation! I hope this is Emma Pfaeffle's audition for the real movie adaptation. 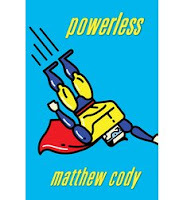 In the middle grade Powerless by Matthew Cody, Holmes and Watson were characters in books. In this book, main character Michael just admires Holmes and studies him. It's a good thing he does, because he moves into a new town, a new town with kids who have secret superpowers. Real ones like flying and super strength. While Michael seems powerless in comparison, being merely smart and heavy on acquired Holmes knowledge, when these superkids are having their superpowers stolen from them, they don't need another guy with superpowers to lose. These kids are losing their powers on their thirteenth birthdays. Some kind of comment here about puberty destroying childhood? Because adolescence is a freaking train that knocks you right off the tracks? Is Michael a superhero in his own right, his intelligence making him the equal of the super kids? Well, you know what side I come down on in that discussion. Obviously, he is a Holmesian superhero. My theory now is that child and YA readers are not attracted to the man Sherlock Holmes, who only only comes out of his apartment to work and who only has one friend. What they're interested in is what I was interested in as a child reader of Sherlock Holmes--his ability to right wrongs and serve justice simply with his mind. His super intelligence didn't come to him because he is an alien or was exposed to some kind of chemical that changed him. It's something he just had or developed on his own. Therefore, Holmes is a hopeful hero for us, because while we learn pretty young that exposure to chemicals and radiation leads to some grim things and not spidie sense and that nothing alien has ever arrived on our planet that looked like Superman, intelligence is another thing. Maybe we have super intelligence like Sherlock Holmes and don't know it, or maybe we can develop it somehow. There's a chance we can become like Sherlock Holmes. And that's why there continues to be a child audience for Holmes-related stories. 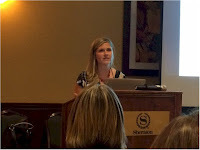 I've been doing a lot of writing about conferences recently and all the different types of information that can be acquired there. But writers' publications can be good sources of info, too. Not so great on building the old social portfolio, but magazines are cheap, you can read them at your convenience, you can read them anywhere, you can read them in your nightclothes. They have a lot to offer. So let's consider a couple. I've been subscribing to Poets & Writers for a few years now. It's on the literary side. It's heavy on advertising for MFA programs. The back of the mag has a big section on grants & awards & residencies. I think an argument could be made that it is marketed to those writers who have recently been described as privileged. Those writers who can come up with the money for MFAs, conferences, and residencies, and can afford the time away from a day job to attend them. I will be honest and say that I lean toward privilege these days, myself, being a writer with a supporting spouse. Perhaps that's why I like reading about conferences and retreats, though I don't attend many. For instance, the issue you see here had an article on a conference "that is aimed at inspiring writers and triggering new work rather than shopping around the old." That sounds good. Also, P&W does a regular series on self-pubbed writers who have often spent a bundle and have their experience commented on by a marketer and an editor. Those are great. The interview with Jhumpa Lahiri writing a book in Italian? Right up my alley. The only thing that would have made it better would have been if she'd written that book in French. Unless she wrote it on a French 2 or 3 reading level, I still wouldn't have been able to read the original edition, but hearing about her experience have warmed my privileged soul. I've just started receiving Writer's Digest because the subscription was only $10. That's how I've ended up with a number of magazine subscriptions over the years. Writer's Digest is more nuts-and-bolts than privilege. 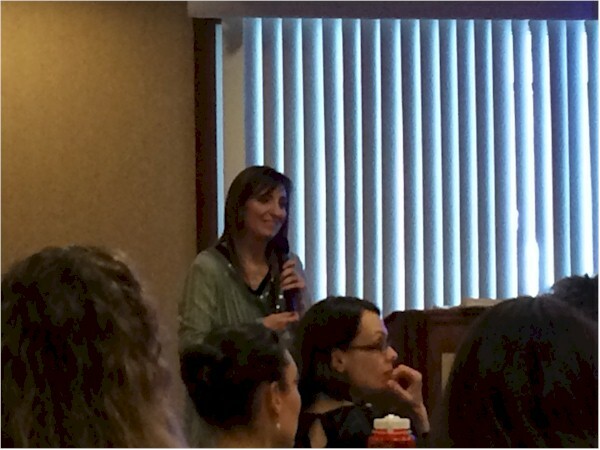 It's into how-to articles like 10 Picture Book Pitfalls--and How to Fix Them by Marie Lamba. I like reading about problems and solutions. I feel a great connection when I hear from writers who have struggled with the same things I've struggled with and can come up with a way to deal with them that doesn't involve me taking a couple of years off from my life to go to graduate school. (I'm privileged but also a little lazy.) I liked having Erika Dreifus (who I kind of know in a vague, "we've communicated" sort of way) state in her WD article, Habits of Highly Successful Short Story Writers, that writers for literary journals should "submit widely and often." That's something I need to hear right now. 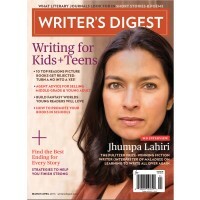 I'm sure you can't help but notice that Jhumpa Lahiri was on the cover of the March/April issues of both Poets & Writers and Writer's Digest. The P&W article was a conversation with the translator of Lahiri's book, In Other Words, and was all about Lahiri's experience writing that book in Italian, a language she has only recently learned. As interesting as that is, it probably won't click with many American, English-speaking writers, of whom P&W readers are just a subset. 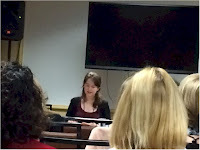 The WD Lahiri article was an interview conducted by a WD assistant editor, and it covers Lahiri's writing and teaching as well as her book in Italian. Many more writers will relate to that. Additionally, the May/June issue of WD's cover story is on 101 Best Websites for Writers. Websites--available to all who can find Internet access. The May/June issue of P&W cover is on writing contests. Contests--available to those who can afford entry fees. I think that pretty much illustrates the difference between the two publications. If you're into magazines (and I so am) choose one or, like me, read both. Goal 1. Adhere to Goals and Objectives. A good week. By the way, one of my objectives for this goal was to plan the goals I would work on each month. 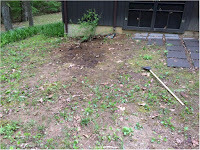 Which I have been doing. The flash piece I've been working on is nearly done. Within words of being done. Goal 6. Generate New Work. 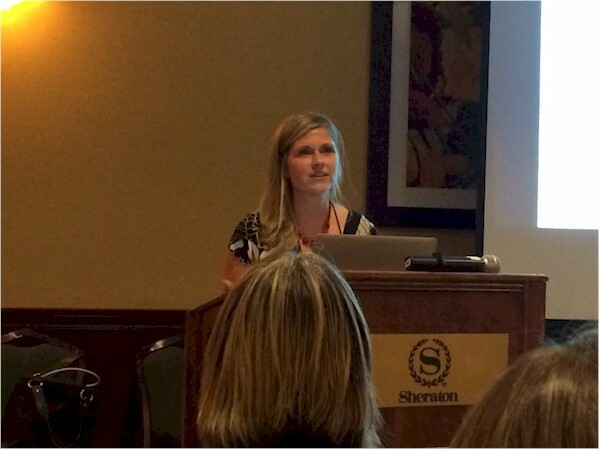 Did I Use Anything I Learned At The Conference? I did start reading the eBook recommended by Wendy Maas during her blueprinting workshop. Hmm. This doesn't look like as productive a week as I felt it was. Maybe because part of what made me feel productive was the organizing I did. Which doesn't look like much but could end up doing good for me in the future. I'm making an attempt to write a picture book manuscript, something I've tried before without success. 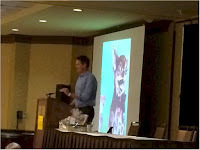 While at the NESCBWI Conference at the end of April I came up with an idea with something else to do with my material. Nonetheless, I'm going to slog through trying to complete a draft. I decided to do a little picture book research while working on this project. 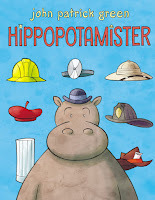 I'm particularly looking for humorous picture books. I'm finding them harder to find than I expected. For one thing, there doesn't seem to be a spot in the library for "Gut Busting Picture Books." Also, I may not understand picture book humor. One of the local librarians picked out some picture books for me that she found funny. Er...ah...uh. Keep in mind, just because we were looking for humorous picture books, it doesn't necessarily follow that these books are meant to be funny. That may very well have not been the authors' intent. I'm finding picture books to be a bit of a mystery. 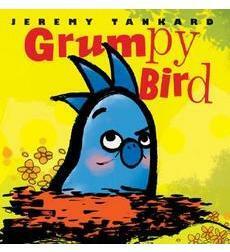 Grumpy Bird Jeremy Tankard. This has a subtle story. The humor is also subtle. Kids who understand grumpiness will enjoy this more than kids who haven't had their own or others' grumpiness pointed out to them yet. The book also has an intriguing ending that I didn't notice the first time I read it. Overall, a nice work. 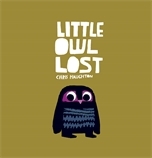 Little Owl Lost Chris Haughton. Love the artwork here. This is the story of an owl who falls out of his nest and is helped to get back to his mom by a squirrel. The squirrel keeps finding the wrong mom. Child readers might find the mistakes humorous and enjoy taking Little Owl's part and setting squirrel straight over and over again. That's an interesting idea. The reader brings the humor to the story. Again, a nice work overall, but this one I didn't find that funny. I think the librarian gave it to me. 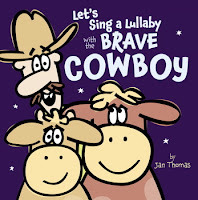 Let's Sing a Lullaby with the Brave Cowboy Jan Thomas. I'm really liking bold, not particularly representational, art in these books. This is another one. This is a bedtime book, and as bedtime books go, this one is probably pretty funny. The humor here is around the fact that the cowboy isn't brave. I definitely find incongruity humorous. I wonder at what point kids get that? Bug in a Vacuum Melanie Watt. Okay, this definitely isn't meant to be funny. A fly experiences a crisis and then goes through Elizabeth Kubler-Ross's five stages of grief. It was published as a children's book, aimed toward the lower grades of elementary school. Perhaps as instructional? If you are an adult with a dark sense of humor, you'll find a lot of jokes here. I don't think it's going to help me as a model/mentor text for preschool picture book humor. 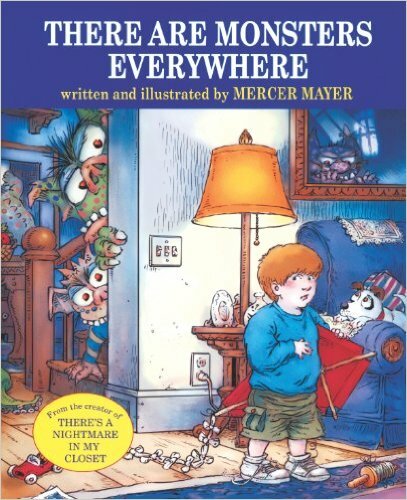 There Are Monsters Everywhere Mercer Mayer. Don't know why I thought this would be funny. Good story about a kid overcoming monsters that may or may not be everywhere. But not much in the way of humor. 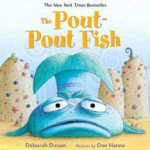 The Pout-Pout Fish Deborah Diesen. 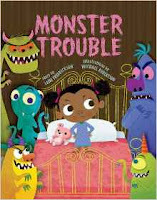 This is another book that I think readers bring the humor to. The pout-pout fish's face lends itself to spreading the dreary-wearies. That is, until someone changes his mind by.... I don't want to spoil the story. I can imagine a child listener and adult reader having a good time with "glub-glubs" and kisses. But this isn't the kind of humor I'm thinking of. Twelve Terrible Things Marty Kelley. This isn't actually a story. It's more like the picture book equivalent of a listicle. Very realistic art illustrates twelve terrible things that happen to many kids: gravy day at the school cafeteria and elderly ladies looming in for a cheek pinch. 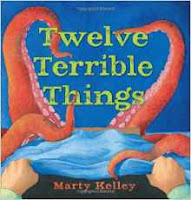 This is clever and witty and probably for grade school age readers who will have experienced these "terrible things" and recognize that "terrible" is being used loosely here. Monster Trouble Lane Fredrickson with art by Michael Robertson. Okay. This one has both the story and humor I'm interested in, for the age group I'm interested in. 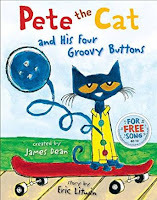 Pete the Cat and His Four Groovy Buttons Eric Litwin with art by James Dean. I am sure I picked this book up because it had "groovy" in the title. 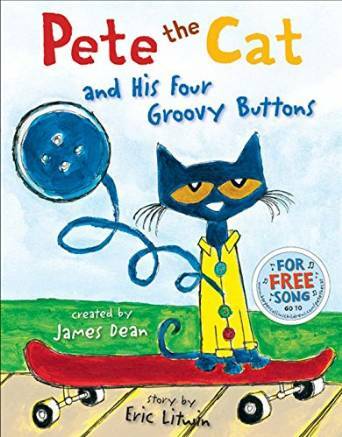 It is a groovy book about...math! Again, it has the story and humor I'm looking for. Also, I know someone who would love this. 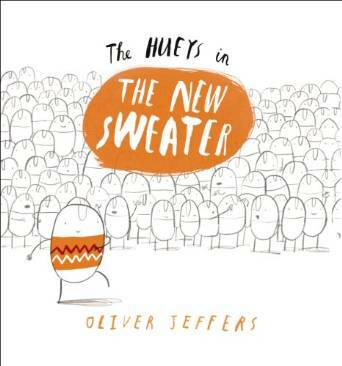 The Hueys in the New Sweater and The Hueys in It Wasn't Me Oliver Jeffers. The thing about the Hueys is they're thumb people. Come on. No one notices that? Or maybe they're bean people. But for such unsophisticated bodies, they have sophisticated issues related to uniformity and getting along. There is some humor here, but the books are also thinkers. I like It Wasn't Me because of the randomness of the climax. 12 Habits Of The Most Productive People turned up on my Facebook page last weekend. I've been trying to avoid reading articles with numbers in the title (the subject of a future blog post), but I fell for this one. It was published at a site called Fast Company, which describes itself as the "world's leading progressive business media brand, with a unique editorial focus on innovation in technology, ethonomics (ethical economics), leadership, and design." How is that related to writing? you may well ask. Of course, it is! Everything in the world is related to writing! In this case, author Gwen Moran says some things about productivity that writers may not usually consider but could find helpful for managing their time. Moran says productive people believe that only 20% of what they do really matters and that's where they focus their attention. What I think this means is that they don't try to do everything. and adapting to our present work situations. A book is about to publish, means we're in a situation in which we have to focus on marketing and let other things go for a while. Public appearances coming up? That situation means we have to focus on preparing content instead of doing other things. This is probably why you hear some more established writers talking about blocking out months for writing. They're trying to create a situation in which they can focus on just that 20% of their work life for a while. Many "urgent" issues come up and urgent usually requires attention right away--taking phone calls, answering e-mails, acting on a promotional opportunity that just came out of nowhere. But just because something seems to require immediate attention, it doesn't necessarily follow that it's actually important. I thought this one was particularly interesting, myself. It's easy to be distracted by a request for a workshop proposal that suddenly turned up in the e-mail. But if the deadline is two months away, it isn't important or really even urgent at that point in time. It just seems that way. 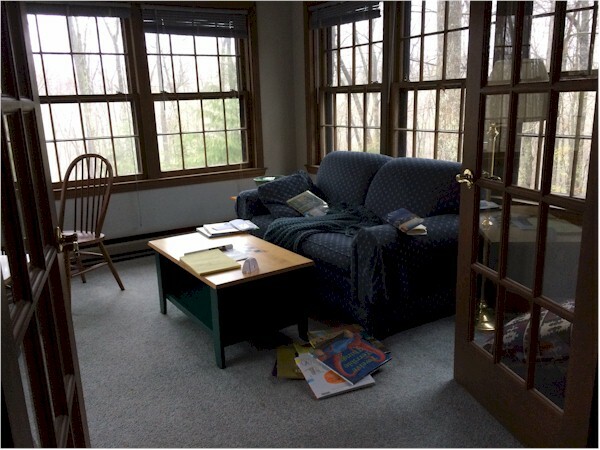 Many writers work out of their homes and are always struggling with the thin, fluctuating boundary between professional and personal time. Family interruptions are not necessarily important. They just seem urgent because they're in our faces. Productive people have small tasks in mind that they can knock off in odd blocks of time--while waiting for meetings and appointments to start, while traveling, etc. Writers have lots of small tasks they can take care of when bits of time suddenly become available. Project reading/research, professional reading, checking out other writers' blogs, checking Twitter feeds/contacts. Cleaning a desk. The list goes on and on. Actually, I've come up with a lot of blog post ideas when reading while traveling. In fact, I'm working on this blog post while waiting for someone to turn up and check out a problem I'm having with my word processing program. I can't finish that project, so I shifted to this one that's nearly done. "Strategic quitting means ditching the things that you shouldn’t or don’t want to be doing because they aren’t worth your time." This is a huge, huge issue for writers. When do we accept that a writing project just isn't going to work out? How do we accept all the time we've put into it being wasted? When do we decide that we really could be more productive working on something else? We may need to learn to quit. Check out the rest of the article to see if any of the other habits Moran describes are ones you want to form for yourself. Well, it wasn't a total binge read because we're having trouble with Interlibrary Loan here, which may be the subject of another blog post one day. So I knocked off the first two books in this series, and then had to cool my heels for a bit before I could get the third. 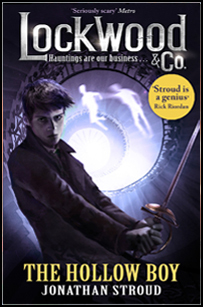 Jonathan Stroud wrote the Bartimaeus series, which I liked a great deal, particularly Book Three, Ptolemy's Gate. His new series, Lockwood & Co., is totally different and yet similar because, once again, we are in a very intense and detailed alternative England. Though there isn't a character as amazing as Bartimaeus in these books, they're still very good. In the Bartimaeus universe, a demon world is controlled by human magicians, at least to the extent that they are able to drag various kinds of demons into the human world to do their bidding. These magicians are in positions of power in government. 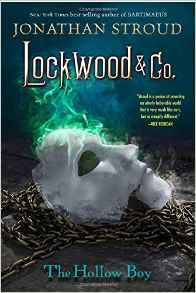 In the Lockwood universe, a ghost world is totally uncontrolled. The dead turn up not to do the bidding of the living but to torment and even destroy them. Instead of powerful magicians we have children with powers. Children are able to see the spirits. Depending on their powers/gifts, children may be able to hear spirits, see them, "feel" a presence. Children and teenagers are tasked with protecting adults from the spirit scourge. That is, until the children age out and become adults who need protecting, themselves. This is a universe in which we have cars, telephones, and doughnuts, but no computers or cellphones. Anthony Lockwood, the teenage head of Lockwood & Co., a small, "select" group of ghost fighters, is charismatic, brilliant, and heroic. Note the English cover of The Hollow Boy to your right. 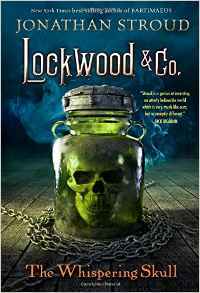 Note that Lockwood appears on all the English covers. He is not, however, the main character in this series. That would be Lucy, one of his agents. She is extremely gifted, spook-wise, and just a little bit sympathetic to the plight of at least some of the dead who are hanging around where they're not wanted. We readers can see that she is a little bit attracted to Lockwood, too. The third member of this Scooby Gang is particularly interesting because he's the stereotypical tech nerd for the group. Except, remember, I said there is virtually no tech here. Still, he performs the tech nerd function, because he is always running off to archives to do research on their cases. Oh, wait. There's another character. A Bartimaeus-like character. He's pretty minor, and I'm not sure what's going to happen with him down the line. Each book has it's own story-line/adventure with a violent climax that often has an "all-is-lost" moment. At the same time, each book has a modest cliff-hanger, or at least a lead-in to the next volume, making them part of an overall story encompassing all the books. And, like I said, something's going on with that Bartimaeus-like thing that isn't limited to one book. And What About The Lockwood Darkness? These are really dark books. Death is a daily threat for everyone, and there doesn't appear to be any hope of a Heaven waiting for those who don't make it to tomorrow. There's no talk of school for children. They go to work young and at horrible, dangerous jobs. If they don't die first, they'll grow up and lose their ability to see and deal with ghosts. What will become of them then? A lot of YA fantasy is dark. The Bartimaeus books certainly are. So is Skullduggery Pleasant. The Daughter of Smoke & Bones series is pretty grim, particularly for a romance. And, now that I think of it, I believe all those books have a violent climax, too, with some characters at risk or even lost altogether. Well, conventional wisdom claims that young (and not so young) readers can safely explore disturbing or even frightening subjects in fantasy because none of this stuff can really happen. The dead don't come back. There are no demons controlled by high-ranking politicians. (Yeah. I know. There's a joke there.) Skeletons don't wear fedoras and drive fancy cars. 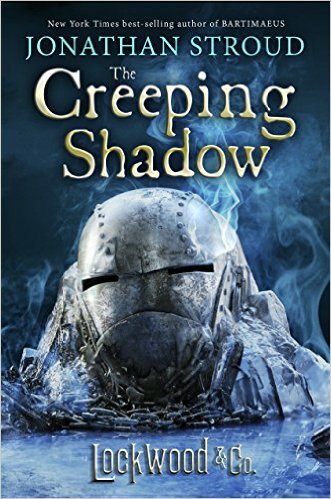 Not only can readers explore disturbing stuff in fantasy because it doesn't happen, it's okay to enjoy it. If these things could really happen, it would be so wrong. 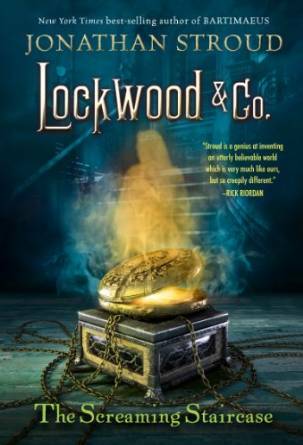 Another Lockwood & Co book comes out this fall. If you wait for that, you'll have four books to binge on. That would be fun. Maybe you could do it in October, for Halloween. 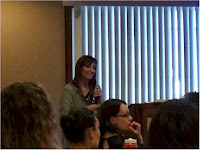 So last weekend, I'm in Kathleen Rushall's NESCBWI Conference workshop on query letters, and she suggests that writers not query too soon. With picture books, for instance, she says writers should wait until they have three manuscripts before submitting one of them. Agents are interested in working with writers on long-term careers. Writers who have several pieces of work, at least in progress, show that they're thinking about a long-term career rather than the thrill of seeing their names on one book. For that reason, agents may ask "What else ya got?" In which case, you probably want to have something. Am I About To Drift Away From The Writing Portfolio Issue? I was mulling on Kathleen's words this past week when I happened to read Submit Like A Man: How Women Writers Can Become More Successful. The author, Kelli Russell Agodon, a former literary journal editor, contends that when men receive a rejection from a lit magazine with a "We want to see more of your work" note, they get more work in to that editor. When women receive that same response, they take much longer to get back to editors, sometimes not resubmitting at all. I am one of those women writers who have received positive feedback with a rejection from literary magazines and didn't respond to it. In my case, lack of confidence wasn't what held me back. 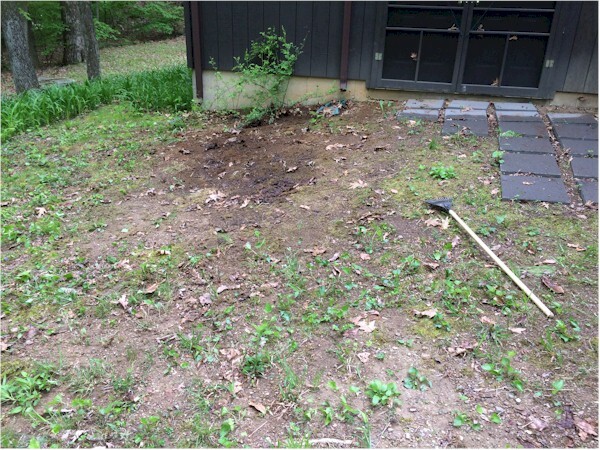 What held me back was that I didn't have another appropriate piece of work to submit. I do have a stash of short stories and essays, but they are varied in genre and subject. I once had an editor indicate he would be interested in more work. But he edited a science fiction magazine and I had only one scifi short story, the one he'd just rejected. I truly didn't have anything else to send him, and I'm not the kind of writer who becomes inspired under pressure. I accept that I'm never going to just sit down and knock off a publishable story in a week or two, on demand. Well, maybe there is some lack of confidence operating there. But my point is, if I had a portfolio of material--a couple of science fiction pieces, more than one memoir essay, a few articles about writing at least outlined--instead of the random short stories and essays I have now, I could respond to a "What else ya got?" editorial request in a timely manner. Just as a writer who has some picture book work lined up could respond to an agent asking the same thing. As it turns out, this month I am working on short form writing. I'm going to take a look at what I have on hand and think about whether or not I have ideas for, shall we say, companion pieces? Even if no one asks for more work, if I've found an appropriate market to which I can submit Piece A1, I can later submit its companion, Piece A2 there. What I'm doing now is starting researching all over again for Piece C3. Hmm. Maybe that's still another reason to maintain a writing portfolio. The winners of this year's Tassy Walden Awards have been announced. The award is for unpublished Connecticut children's writers and illustrators. Finalists: Brianna Agnew-Weber for A Noble Lie, Mark Fitzpatrick for The Blaze Arising from Sugar Street, Miriam Giskin for Which Lies to Tell, Nancy Pfeiffer for My Checkerboard Life, and Rudy Vener for Upgrades. The Tassy Awards are significant here in Connecticut because of the number of former winners who went on to publication. 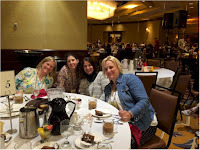 FTC Transparency Info: I am acquainted with Linda Zajac through the NESCBWI, and Holly Howley and Heather Sherlock DiLorenzo are members of my writers' group. Time Management Tuesday: Are Conferences A Good Use Of Time? For some people, going to writing conferences and retreats is like going to camp. They get quite excited about seeing friends and, I guess, being away from home. Personally, I'm more into the creative buzz I get from attending a day-long writing program. I believe I've written here before about my family members who won't attend conferences in their fields. The uneven quality of the workshop offerings at these things makes them feel they're wasting time. They're also serious introverts. Not only are they unlikely to be able to take advantage of the networking opportunities at conferences, those networking opportunities are torture for them. 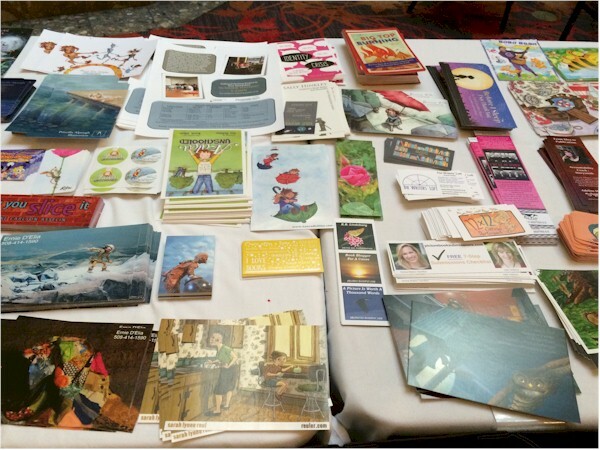 This past Saturday I met a woman at the NESCBWI Conference who had been there since Friday. She was mulling over how much benefit she was getting to from her experience. She asked me, "Have you had a single workshop you were satisfied with?" 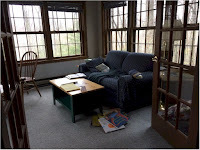 Though I had, I also had to admit that I'd given some thought a little earlier to whether or not I would be getting more from my day if I'd spent fifty or sixty dollars on books about process and locked myself in my sunroom with them. Uneven quality. No possibilities for networking. Yearning for a sunroom. Sometimes you do have to wonder if conferences are a good use of time. As I've said before, in order to get anything from conferences, you have to keep your expectations realistic and your mind open. You have to go into conferences aware of all this and reconciled to it. You really don't want to go into these things as if it's Christmas and you're sure you're getting a pony. That sets you up for a very bad conference. Essentially, you have to expect that it's going to be the odd little moments at conferences that will provide you with the most benefit, not the advertised events. Years ago, I worked for an agency that ran training programs for municipal and state employees. We were grant funded and had to justify our existence, in part by showing that what we did had value for the people we did it for. We tried to do that by conducting post-training surveys, well after the contact date. Why? Because we were trying to avoid the halo effect, the belief that a training program was good because the participants had a good time or liked the trainer. We wanted to be able to tell if the training the participants received changed how they worked. 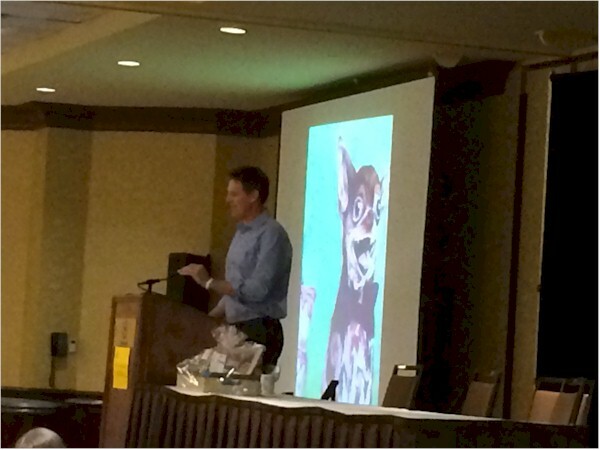 Because the point of a training program, or a conference, is not to have a good time or to get a creative buzz on. It's to change how you work, your behavior. So putting aside the whole fun with friends and getting off on creativity business (legitimate reasons to attend a conference, IMHO, for those who roll that way), a very practical way to determine whether or not conferences are a good use of your time is to pay attention over the weeks and months after you attend one. Notice whether or not you're using things you learned there. Anything at all, whether it was real material from a real workshop or something related to a brainstorm of your own. Hmm. I'm going to try to do this during my Friday goal and objective checks.